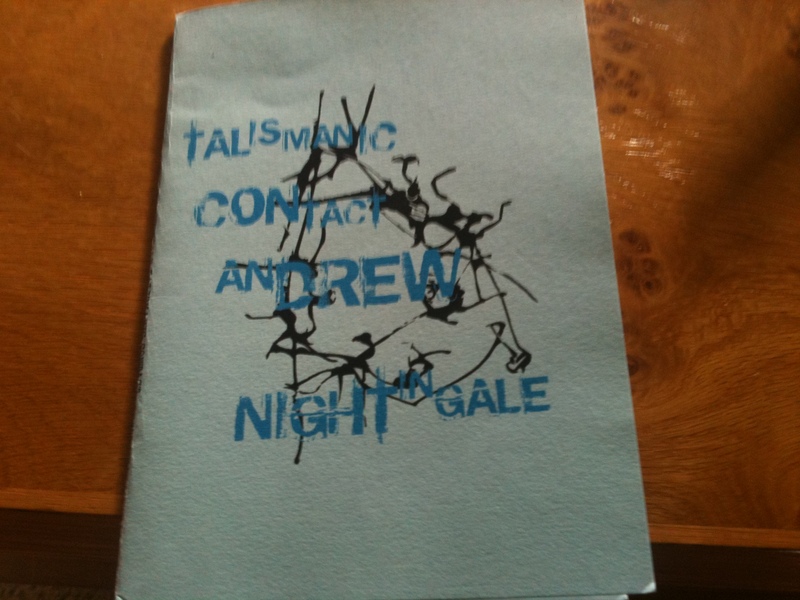 When handing out various The Knives Forks and Spoons Press pamphlets to reviewers there was one that everyone automatically had a negative reaction to: Andrew Nightingale’s Talismanic Contact. It’s not a surprising reaction, the pamphlet consists of six figures that, at first glance appear to be gibberish. Beautiful gibberish of course: these are visual poems that look to me like blood clots, or a city viewed through its paths, or some sort of microscopic body made out of letters. I expect a scientist could pinpoint much more accurately than me what it could be, but even without knowing, one gets a sense of a small organism blown up to such a large scale that it seems other. 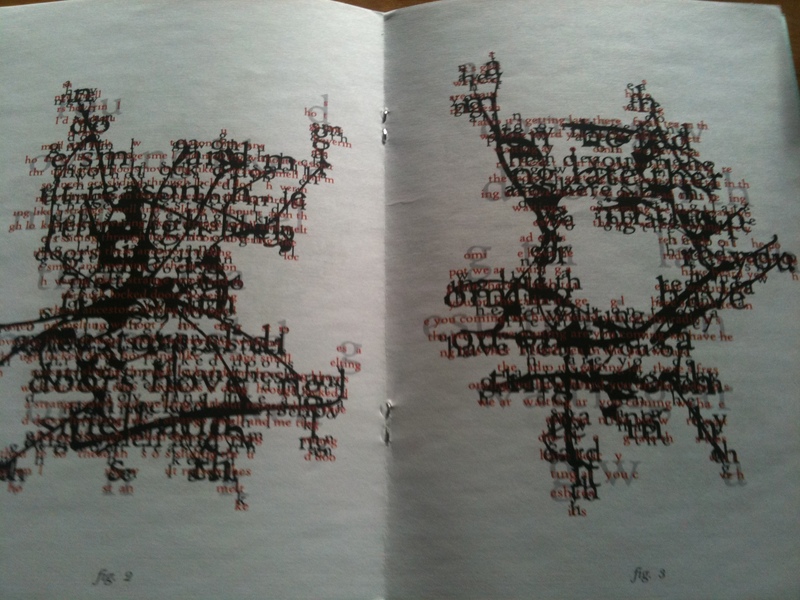 The titles, kept on a separate page, each add to the strange beauty of the poems: ‘fig. 4: Talisman for communing with lightning conductors’ or ‘fig. 2: Talisman for contacting a presence’. They hover between the illusion of scientific remoteness and the daredevilry of poetry. By daredevilry I mean the wonderful insolence with which we poets assume that we can communicate with uncommunicative objects or concepts. The words aren’t particularly exciting or unusual for the subject matter (though ‘strange smell’ is of course immediately effective) there is a lack of specificity. However, the subject of ancestors haunting a house is particularly appropriate for the format chosen: as we see the words sliding, hovering, disappearing, with letters erased or cut-off, the looping phrase really does seem like a talismanic chant. 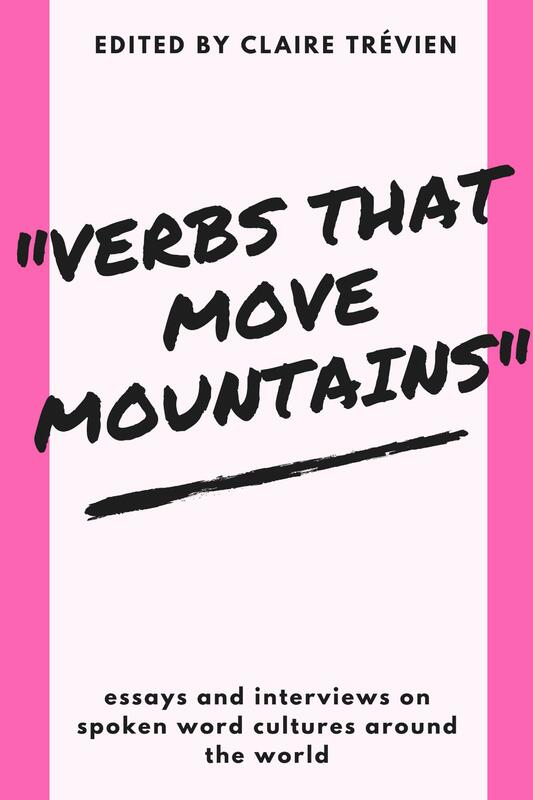 Though the phrase itself seems simple, the format in which it occurs forces the reader to re-examine it. Here the repetition sounds eerily robotic, frightening at turns, with an edge of desperation. The pot of fresh tea is a reassuring reminder of domesticity in a garbled communication with an unknown entity. Tea is a cliché in stressful situations of course, but that is just a reminder that clichés are yet another form of talisman: a well-set stereotype block that one can press when other words seem out of reach. Talismanic Contact is not an elitist work, but it does reward those who take the trouble to take a closer look at the dabs of paint. By forcing the reader to experience different readings of the work, Talismanic Contact is a useful reminder that poetry shouldn’t always have to be digestible ‘on the go’ or in performance.